I always love looking around in second hand clothes shops, but as much as I admire people that manage to dig up an entire outfit for only a couple of euros, I myself never manage to do the same. I start all enthusiastic and excited and in the end am overwhelmed by the amount of clothes and especially by the dust and the smelliness. However, just around the corner from me is Cheap Fashion, a shop full of vintage clothes, bags, shoes and other accessories. Here you can find anything. The have lots of extreme dressing-up gear, but also plenty of the more normal stuff (warm faux fur coats, summer dresses, Levi’s jeans, caps). 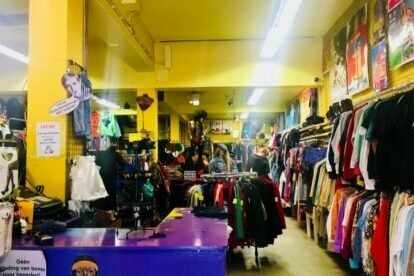 As the shop is so close to home, I stop by at least once a week, and now, slowly but surely, my closet is starting to fill up with more and more vintage items. What I love most about Cheap Fashion is the fact that their clothes really are very affordable — where else would you find a warm and stylish winter coat for only €15? The Cheap Fashion store is quite big and full and covers two floors. Want to shop more vintage? Try Tony’s Garage Sale or Kringloop Gordelweg for more vintage clothes and a lot of furniture and interior accessories.